The Norton Online Quizzing Engine is an assessment tool that delivers a straightforward sequence of questions designed to help students and instructors understand what students know. Online Quizzes take a summative approach to quizzing, allowing unlimited attempts to improve final scores, and are not designed for high stakes testing. How do I register for Online Quizzes? 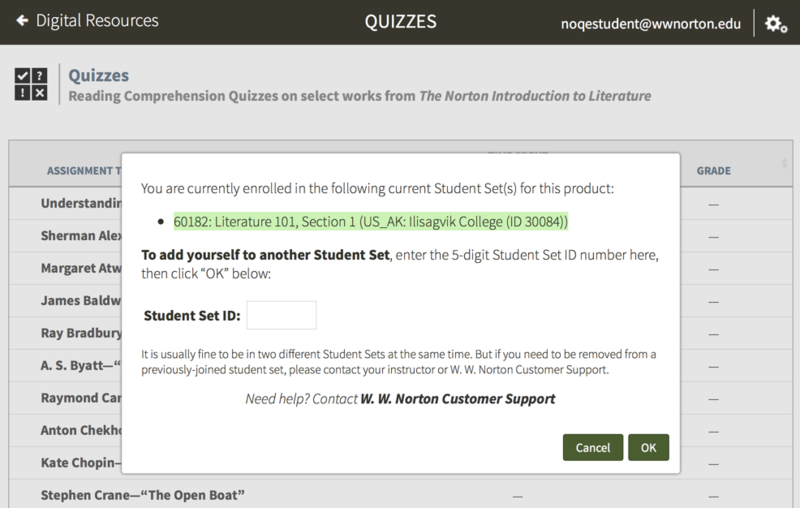 An Online Quizzes registration code comes for free with new copies of select Norton textbooks. You can purchase access to Online Quizzes online. If you purchase an ebook, your ebook purchase will automatically entitle you to Online Quizzes access. You can access Online Quizzes for three weeks through trial access. At the end of three weeks, you will have to enter a registration code or purchase access online to continue using Online Quizzes. How do I join my instructor's Online Quiz section? Your instructor's Online Quizzes section is called a Student Set. To join your instructor's Student Set, enter your Student Set ID. You will be asked for this the first time you access Online Quizzes, but it can be entered at any time by selecting Add Yourself To a Student Set in the Quizzes gear menu at the top right of the page. All work you've previously completed will now be viewable by your instructor. How do I check that I joined the correct student set? Click on the gear icon in the upper right corner and select Add Yourself to a Student Set from the menu. Any Student Sets of which you are currently are a member will displayed near the top of the window. You can add yourself to as many Student Sets as you would like. However, you cannot remove yourself from a Student Set; only your instructor can perform that action. If you enrolled in the wrong Student Set, enroll in the correct one and notify your instructor of the mistake. Your instructor can then remove you from the incorrect Student Set. If you joined a Student Set that is not accessible to your instructor, please contact W. W. Norton Customer Support to be removed from the incorrect Student Set. What if my instructor doesn't give me a Student Set ID? Don’t sweat it. There are two likely reasons for this: Either your instructor is not assigning Online Quizzes for a grade, or it’s integrated with your campus learning management system (Blackboard, Moodle, etc. ), in which case you don’t need a Student Set ID; your grades will automatically report to your instructor. Where can I watch how-to videos? How do I change the email address I use to access Online Quizzes? If you registered or purchased access to Online Quizzes and you used the wrong email address, click on Change Your Email in the gear menu in the upper right corner. Provide the required information on the Change Your Registered Email Address window and click the Submit button. Please note, you can update your email address any time within 14 days of creating your account. After 14 days, please contact W. W. Norton Customer Support for assistance.